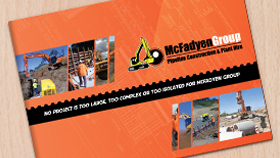 McFadyen Group - McFadyen Group (MFG) services Australia for any project, of any size, in any location. They are the leading supplier of Plant and Equipment. McFadyen Group (MFG) has worked on numerous projects throughout Australia, successfully completing Plant Hire and Pipeline Constructions services for each of them. Working with industry leaders among civil contracting, Government Departments, and Local Authorities, there is no project that is too large, too complex, or too isolated. For all your sewer, stormwater and water main installations. MFG can service any location in Australia for the provision of any Wet or Dry Plant Hire. MFG has provided Plant Hire for a number of construction projects in Brisbane, on the Sunshine Coast and Gold Coast, and greater Queensland, including for the Clem 7 and the Gold Coast light rail completed projects, amongst many others. MFG has been the Plant Hire supplier of choice for many construction projects in New South Wales, for projects around regions such as Woolgoola, Sapphire, Coffs Harbour, Nambucca Heads, Warrel Creek, and many more. MFG works with a range of companies, such as civil contractors and Government departments across Australia to complete major construction works wherever required. From Northern Queensland to South Australia, MFG can supply any location with the right Plant Hire and Plant Combo for Pipeline Construction for any type of works. Having worked on major construction projects like the Airport Link in Brisbane, plus many others across Australia, MFG is one of the leading Plant Hire service providers in Australia. Known as the supplier of choice for Plant Hire in Australia, MFG can supply Wet or Dry Plant Hire to suit any project needs. No matter where a project is located, MFG can supply major construction works with the Plant Hire required to succeed.